This carp lake contains over 450 carp; this includes a good head of doubles and twenties along with around 15 fish over thirty pounds, the biggest weighing just over 42lb. Tench and bream to over 10lbs have been caught in the past along with some with pike and some spectacular shoals of Roach & Rudd. 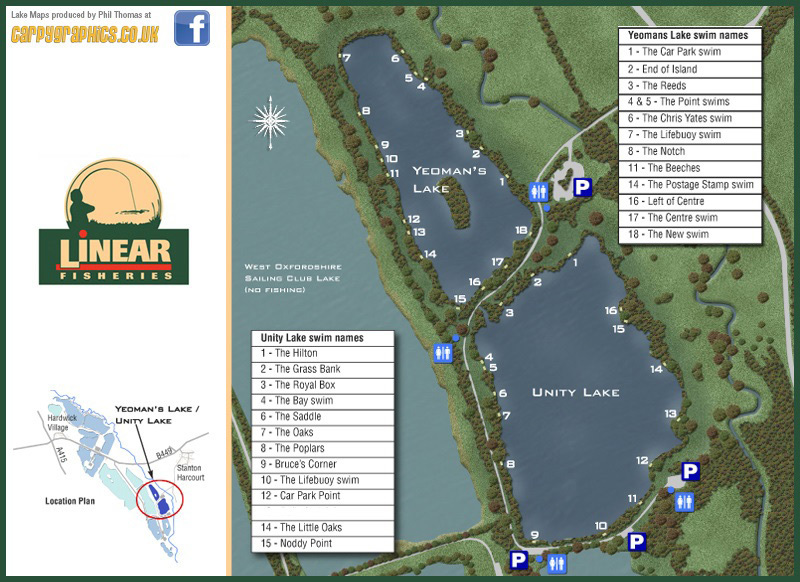 At fifteen acres, the first and smallest lake you come to after crossing the river bridge to the Guy Lakes complex is Yeomans Lake. This water contains an island and is reed and tree fringed. We estimate that there are over 450 carp in the water with at least sixteen of these topping 30lbs, amongst the biggest caught over the last couple of years was a common of 36 pounds and a mirror over 42 pounds - the records for the water are: mirror carp 42lb, common carp 38.08. Linear will continue to stock the water when and wherever necessary with selected carp from their stock waters. The water continues to produce good fish and recorded weights continue to rise.